There are a number of challenges that we will have to overcome in the media field, Parliamentary Reforms and Mass Media Ministry new Secretary Nimal Bopage said. He said the challenges include the adopting of Right to Information Act, equipping journalists with the latest technology and the establishment of an independent regulatory mechanism for media. 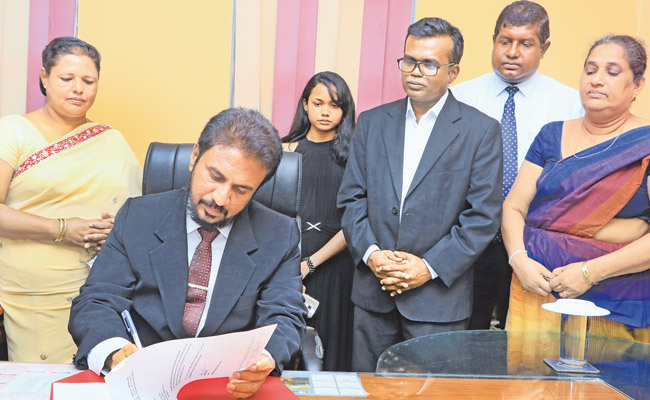 Bopage assumed duties as the new secretary to the Parliamentary Reforms and Mass Media Ministry in a ceremony at the Ministry in Narahenpita yesterday. Addressing the media, the secretary said he was advised by the President and the Prime Minister to work independently and unbiased while playing the role of an independent government worker acceptably. “The President told me that I will be entrusted with the duties as the Media Secretary for the sake of the public but not to serve the President. The President also added that both he and the Prime Minister have their own Media units to give them media coverage. Therefore the President asked me to handle the media of the country as he has to be responsible for it,” Bopage said. ZThe secretary also emphasised that the journalists should take all possible measures to report news with responsibility and transparency without making suspects of incidents convicts, by what they report. Parliamentary reforms and Mass Media Deputy Minister Karunaratne Paranavithane, Additional Secretary to the Ministry H. D. S. Malkanthi and the family members of the new secretary were also present.